Introducing The Class of 2019! 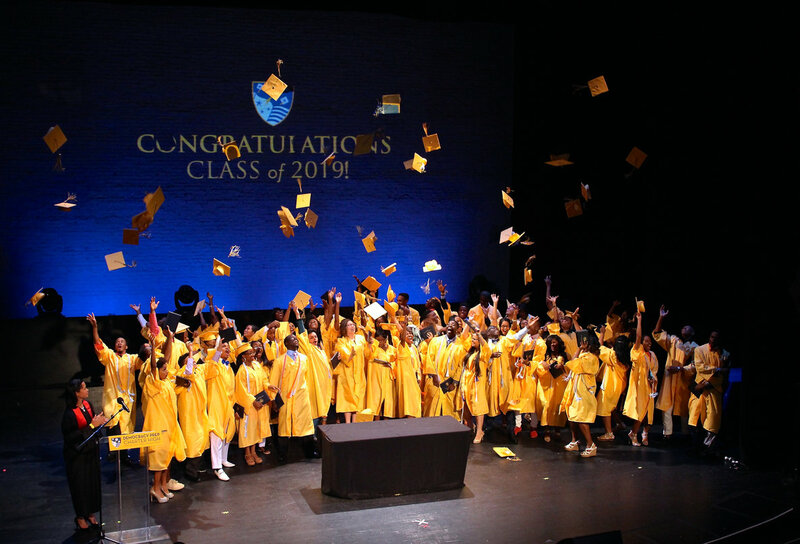 Outfitted in yellow gowns, mortar boards with blue and gold tassels and smiles, the class of 2019 became the third senior class to graduate from Democracy Prep Charter High School today. The sounds of applause, whistles, and cheers could be heard over “Pomp and Circumstance” as the seniors marched down the aisles of the iconic Apollo Theater in West Harlem. After a welcome speech from DPPS CEO Katie Duffy, and an opening introduction from principal Natasha Trivers, the senior class was treated to several speeches that included advice for college life, and reflections on the memories made during their final year at DPCHS. The faculty address was given by Social Studies department chair, Jacklyn Doig-Keys who in between jokes and tears, told the scholars to never shy away from opportunities to travel. “Don’t forget where you came from, but don’t let that stop you from moving forward,” she said. The class of 2019 is the largest class to graduate from Democracy Prep Public Schools.